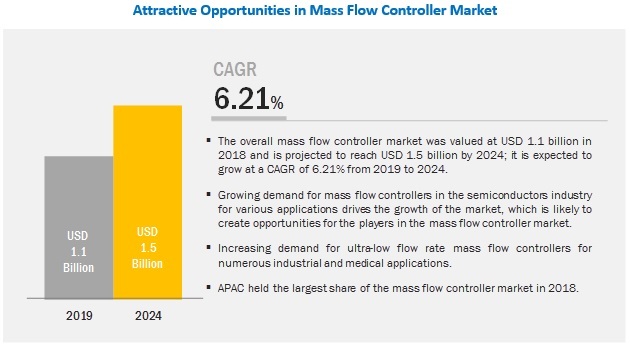 [159 Pages Report] The mass flow controller market is expected to grow from USD 1.1 billion in 2019 to USD 1.5 billion by 2024, at a CAGR of 6.21%. Growing demand for mass flow controllers in semiconductors industry and surging demand for intelligent flow meters in chemicals and water & wastewater industries are the critical factors driving the growth of the mass flow controller market. Mass flow controllers with low flow rates play a vital role in the pharmaceuticals industry for the measurement and control of different media (gas and liquid). For example, in the medical application, mass flow controllers are used in ventilation devices. The ultra-low flow measurement and control capability of the controllers improve the accuracy of ventilation devices and offer efficient control and safety for patients. The use of mass flow controllers in pharmaceuticals, medical, and healthcare devices for enhancing safety and accuracy would drive the growth of the mass flow controller market. Spray and coating are commonly used processes in the semiconductors industry for wafer cleaning, thin film deposition, precision coating, and chemical vapor deposition. In all these processes, mass flow controllers are used to control fluid and gas flow at a low rate. The accuracy of the flow control and stability in the measurement are the 2 important factors to be considered while selecting mass flow controllers for these critical applications. The growth can be attributed to increasing demand for mass flow controllers in liquid and gas treatment applications. Owing to the growth of the market for low flow rate mass flow controllers, many companies are investing in its development. Low flow rate mass flow controllers are used in industries, namely, semiconductors, chemicals, and food & beverages, for various critical applications in which high precision and stability are essential. For example, in laboratory research processes of the chemicals industry, various sub-processes such as testing and heat treatment need low flow rate mass flow controllers. Also, in the semiconductor chip manufacturing for the doping process, it is essential to control the flow of deposition media at a very low flow rate. The mass flow controller market in APAC is expected to grow at the highest CAGR during the forecast period. APAC is expected to dominate the market due to factors such as increasing population, emerging economies, and rising adoption of mass flow controllers across different end-use industries such as semiconductors, oil & gas, medical, pharmaceuticals, and chemicals. Increasing investments in the semiconductors industry and rising demand for efficient devices for measurement and control, and industrial automation are among the major factors driving the growth of the market in this region. Most of the key players operating in the mass flow controller market have their production capacity in APAC as the production cost in this region is lower than that of in other regions. Bronkhorst High-Tech (Netherlands), Brooks Instrument (US), Burkert Fluid Control Systems (Germany), MKS Instruments (US), Sierra Instruments (US), Horiba (Japan), Sensirion (Switzerland), Alicat Scientific (US), and Teledyne Hastings Instruments (US) are among a few major players in the mass flow controller market. These players are increasingly undertaking acquisitions and product launches to develop and introduce new technologies and products in the market. In January 2019, Brooks Instrument (US) added the EtherNet/IP digital communications interface to its industry-leading SLA5800 Series mass flow controller (MFC) family of products. Integrating the high-speed digital EtherNet/IP interface to the SLA5800 Series MFC platform increased the controller’s functionality by making it easier for OEMs and end users to leverage real-time, rich process data with high-speed digital communications. In January 2019, Bronkhorst High-Tech (Netherlands) launched the IN-FLOW series of mass flow meters and controllers featuring a rugged, IP65-rated dust-proof and waterproof design. Available for flow ranges from 0.05–1 mln/min up to 200–10000 m³n/h air-equivalent, the IN-FLOW series flow meters come with optional ATEX approval for use in Category 3, Zone 2 hazardous areas and are now offered with FM approval for Class I, Division 2 to meet the needs of the North American market. In February 2019, MKS Instruments (US) completed the acquisition of all the issued and outstanding common shares of Electro Scientific Industries (US), an innovator in laser-manufacturing solutions for the micro-machining industry, for USD 30.00 per share, or ~USD 1 billion. What are the upcoming industry applications for mass flow controller? Which region provides good opportunities for the growth of the mass flow controller market? What are new application areas that companies in the mass flow controller market can explore? Who are the key market players, and how intense is the competition? The study involved 4 major activities in estimating the current market size for mass flow controller (MFC). Exhaustive secondary research has been done to collect information on the market, peer market, and parent market. To validate these findings, assumptions, and sizing with industry experts across the value chain through primary research has been the next step. Both top-down and bottom-up approaches have been employed to estimate the complete market size. After that market breakdown and data triangulation methods have been used to estimate the market size of segments and subsegments. Two mass flow controlleric sources of information—secondary and primary—have been used to identify and collect information for an extensive technical and commercial study of the mass flow controller market. Secondary sources include company websites, magazines, industry news, associations, and databases (Factiva and Bloomberg). These secondary sources include annual reports, press releases, and investor presentations of companies, white papers, certified publications, articles by recognized authors, regulatory bodies, trade directories, and databases. Primary sources mainly consist of several experts from the core and related industries, along with preferred suppliers, manufacturers, distributors, technology developers, alliances, standards, and certification organizations related to various segments of this industry’s value chain. They have been interviewed to understand, obtain, and verify critical information, as well as assess future market trends and prospects. Key players in the mass flow controller market have been identified through secondary research, and their market ranking has been determined through primary and secondary research. This research involves the study of the annual reports of market players for the identification of the top players and interviews with key opinion leaders such as CEOs and directors. The breakdown of primary respondents is provided below. The industry’s value chain and market size (in terms of value) have been determined through primary and secondary research processes. After arriving at the overall market size from the market size estimation process explained above, the total market has been split into several segments. To complete the overall market engineering process and arrive at the exact statistics for all the segments, the market breakdown and data triangulation procedures have been employed, wherever applicable. The data has been triangulated by studying various factors and trends from both the demand and supply sides. The market has also been validated using both top-down and bottom-up approaches. This research report categorizes the mass flow controller market by material type, media type, connectivity technology, flow rate, application, end-use industry, and region.